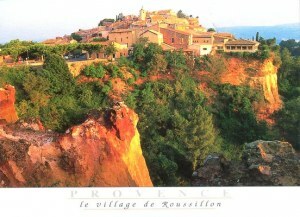 Roussillon is a commune in the Vaucluse department in the Provence-Alpes-Côte d'Azur region in southeastern France. Roussillon lies within the borders of the Parc Naturel Régional du Luberon. It is noted for its large ochre deposits found in the clay surrounding the village. One of the former ochre quarries can be visited via the 'Sentier des Ocres' (Ochre Path), a walk of either 30 or 60 minutes through the old workings.